Cynora and the Karlsruhe Institute for Technology (KIT) launched a new project called cyFLEX that aims to develop develop flexible and luminescent surfaces for smart packaging and advertising applications based on OLED lighting panels. The project follows-up to Cynora's cyFLEX panel demonstration shown in October 2012 and uses the company's solution-processable copper-based TADF OLED emitters. 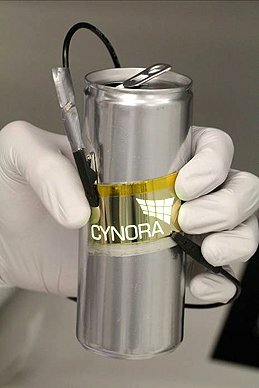 Cynora will develop OLED materials that can be applied for mass-market applications - integrated into packaging. They hope to develop a low-cost, efficient manufacturing process based on printing and coating. The cyFLEX project will run for two years. Cynora will receive a budget of €619,000 out of which €309,000 will be provided by the German Federal Ministry of Education and Research (BMBF). 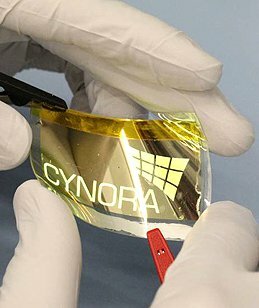 During the project, Cynora will complete a small volume production run of printed flexible OLED film at InnovationLab. This project shouldn't be confused with the cyCESH project which aims to develop new soluble (printable) materials for low-cost high efficiency OLED lighting devices. The cyCESH partners are Cynora, Novaled and the University of Regensburg and it is also funded by the BMBF - with €6.1 million.